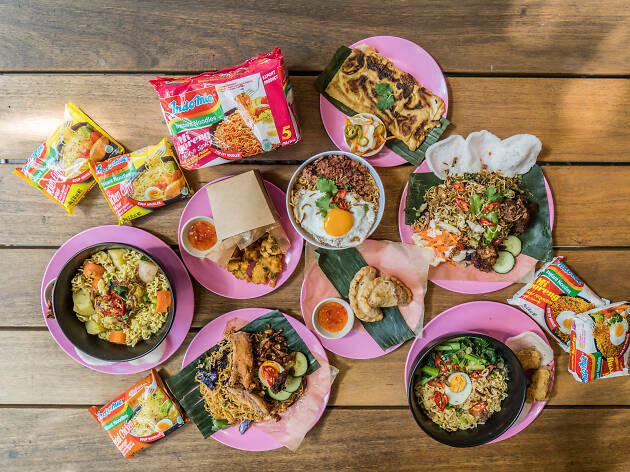 Indonesia’s most famous export, the instant noodle brand Indomie, has opened a pop-up restaurant at Melbourne’s HWKR. The ‘warung’, or shop, is serving Indomie noodle dishes that look a lot less like the 2am meals you made when you were pulling all-nighters at uni, and more like the pictures on the packet. In Australia, Indomie is a quick and cheap meal or a thing to add to Insta-worthy jaffles, but there’s actually more to the instant noodle brand than the 5-pack Mi Goreng. If you didn’t know just how iconic Indomie is to Indonesians, it’s probably best to compare it to Vegemite in terms of how prolific it is across the country. Indomie is sold in school tuck shops if your school had one (this writer remembers eating the dry uncooked noodles at break times), it’s a perfectly normal meal option for breakfast, lunch and dinner, and it’s something you miss when you’re travelling. Much like those KitKat flavours you can only find in Japan, in Indonesia a typical supermarket will stock your standard Mi Goreng number but they’ll also stock other flavours modelled off local dishes like beef rendang or soto ayam (chicken soup). 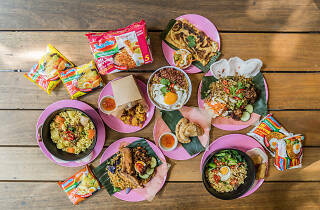 HWKR’s instant noodle warung is highlighting the more obscure Indomie flavours with dishes like mie goreng (fried noodle) with fried chicken ribs and telur balado (fried boiled eggs with sambal); a chicken curry noodle soup; and another with corned beef and fried egg. We tried the mie goreng sambal matah, a spicy number with Balinese beef, Balinese-style pickle sambal on the side, and prawn crackers. It's a slow-fast fusion of instant noodles with rendang-style beef that’s been cooked for hours and the results are tasty and good value at $13. There are also snack-sized items on the menu, including the Indomie fried chicken with added crunch from noodles in the batter; and the non-Indomie pisang coklat which directly translates to chocolate bananas, and is a classic Indonesian dessert of fried banana fritters topped with condensed milk, processed cheese (it works, don’t @ me) and chocolate sprinkles. The Indomie warung pop-up at HWKR is open now. Opening times are 11.30pm-10pm Monday to Thursday and Sunday, and 11.30pm-11pm on Fridays and Sundays. Wondering where to grab lunch in Melbourne CBD? Here's our ultimate guide, from cheap eats to power lunch stations.